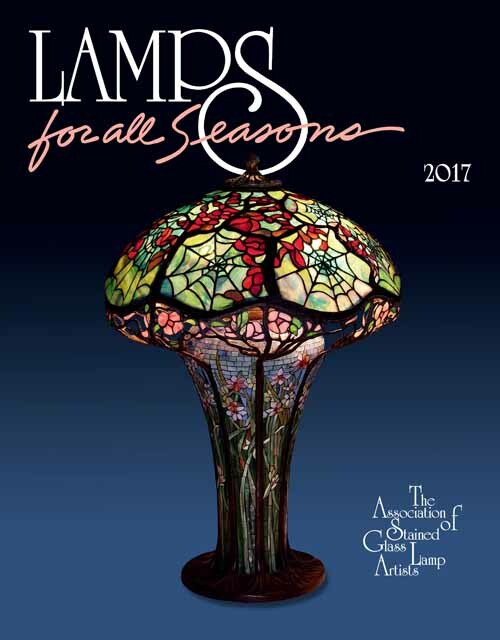 Front Cover (Above): "Cobweb and Apple Blossom"
Our cover lamp is a reproduction of Tiffany's spectacular 18" Cobweb and Apple Blossom. Oceana and Bullseye glass are used throughout. The lamp sits on a beautiful cast bronze mosaic base. Scott Riggs from Huntington Beach, California. Youghiogheny comprises the background in this stunning 28" Tiffany design while the flowers are a combination of Youghiogheny and Uroboros. The stems are cut from Youghiogheny, Uroboros and Bullseye. Order directly at $10.00 each for members ($15.00 for non-members) plus shipping. Note: All orders will be shipped by 1st Class mail; shipping overseas by surface mail is no longer available. The international weight limit is 4 pounds. From your local Stained Glass Retailer or catalog store. Thanks: The Association would like to give special thanks to Sean Scarry and the John Triggs family of the Youghiogheny and Oceana Glass Factory, and Lorna and Eric Lovell of Uroboros Glass Factory, for their enthusiastic support of this project. 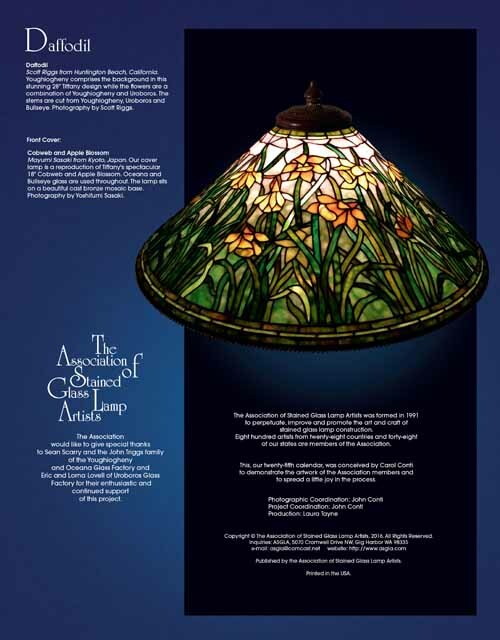 The Association of Stained Glass Lamp Artists was formed in 1991 to perpetuate, improve and promote the art and craft of stained glass lamp construction. Eight hundred artists from twenty eight countries and forty eight of our states are members of the Association. This, our twenty-fifth calendar, was conceived by Carol Conti to demonstrate the artwork of the Association members and to spread a little joy in the process.